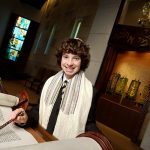 Julie had her Bat Mitzvah at Temple Beth Am in Miami that was a joy to experience for all family and friends in attendance. Rabbi Bookman and Cantor Lisa Segal guided Julie through the ceremony. It was a fantastic night for Julie, Congratulations Julie on your Bat Mitzvah! Special thanks go to Melissa Davis for putting together a great team. Floral and Décor Artistry: Always Flowers. Caterer: Chef David Schwadron. Music: Rhythm City. Video: Broadway Video. Graphics: Zeev Graphics/Avs-Entertainment.